Harviestoun produce some of my favourite dark beers. Old Engine Oil is a truly excellent porter to start with, and once it’s transformed into Ola Dubh by time spent in whisky casks it’s approaching perfection. If I’m honest, the launch of two new beers from the brewery leaves me nervous. Where Harviestoun really shine is making traditional, dark beers and here are two light, American-hopped offerings and their heavy use of ‘craft’ terms has me wondering if this is just an attempt to hop on the bandwagon. I’m happy to say my fears are utterly unfounded. 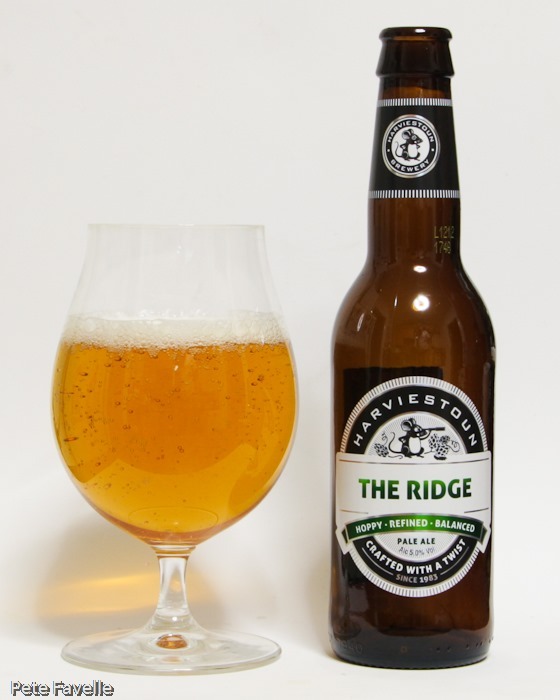 The Ridge is described as a ‘mid-Atlantic’ Pale Ale, which unfortunately makes me picture it being served by Loyd Grossman. In this instance, though, the term is less about an annoying accent and more about the mix of US and UK hops being used. It’s a beautiful looking beer – bright and golden with a thin, fine textured foam lingering on the top. The aroma is gently sweet, with green, slightly grassy hops and the sharp citrus sugar of lemon sherbet. Underneath is just a whiff of more exotic, tropical fruit juice. Foamy in the mouth, you’re initially greeted with a sugary sweetness on the tip of your tongue. This is quickly and almost aggressively countered with a rapidly building, slightly resinous hop bitterness that reaches right to your back teeth. Floral lemony-citrus notes start to appear, along with a slightly richer, caramel backbone. That hoppy bitterness gives a long, powerful finish that just manages to stay on the right side of too much. Fresh, lightly fruity and with a serious hop backbone, this is a deliciously – I’m tempted to say dangerously – drinkable beer. At 5% ABV, my only criticism is that it’s in a 330ml bottle instead of 500ml. A comfortable 4.5 star beer. Many thanks to Harviestoun for providing samples of this beer!